I don’t know what to say here. Basically I think, in WW2 USA you could stick an anti Japanese or anti German statement on a turd and someone would say I’ll buy it. 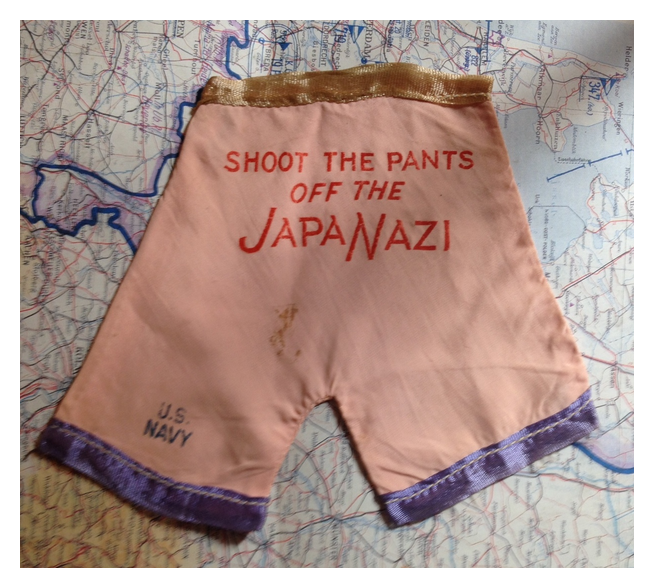 This pair is stamped U.S Navy and has the message “Shoot the Pants off the Japanazi”. So Kitsch. This entry was posted on June 3, 2014 at 9:55 PM and is filed under Propaganda Items with tags Anti-Axis, Novelty Items, United States. You can follow any responses to this entry through the RSS 2.0 feed. You can leave a response, or trackback from your own site.